Join Alena Zilayova, senior charter manager at YPI, Monaco as she offers an exclusive itinerary taking in southern Croatia, starting in Split and heading down into the stunning new superyacht charter destination of Montenegro. Alena Zilayova was born in Slovakia, and speaks five languages including English, French and Russian. Her career to date has taken her all over the globe working in event management and marketing, before making the change into the world of superyacht charters. She joined YPI earlier this year and now organises charters all over the world, including Croatia, where she has fallen in love with what the region has to offer. Trogir is a wonderful old city, a UNESCO heritage site surrounded by sea. It was taken over by the Venetians in the 15th century and remained in their possession for nearly 300 years – you will see the strong Venetian architectural influence with stone paved streets and buildings of characteristic white stone. 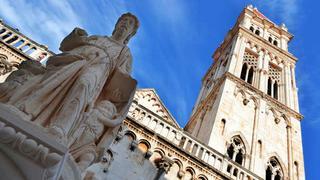 However, Trogir has a history which goes much further back with the first settlements dating back more than 2000 years. • Visit the newly renovated Cathedral of St. Lawrence built in the 13th Century – but note, the climb to the top of the tower is not for those who have a fear of heights. • Why not enjoy lunch in the warm atmosphere of the family restaurant ‘Capo’ situated in the heart of the old town. Just outside Trogir bay is the island of Drvenik Veli, where you will find a lovely daytime anchorage on the south west corner of the island with a charming backdrop of two little islands called the Krknjas. Split is an eternally young city with a population of 300,000 people, who enrich it with their warm Mediterranean temperament. 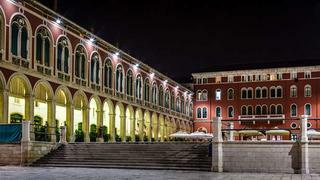 It has stood for nearly 1700 years, at its heart is the Diocletian’s Palace, a UNESCO heritage site. • You may wish to also visit the old part of the town, or venture out to the historic sites situated close by, such as the ruins of Salona or the fortress of Klis. • If you decide to spend some time in Split you may wish to try the restaurant ‘Nostromo’ which is situated next to the fish market and not surprisingly specialises in seafood as well as Mediterranean cuisine. Enjoy wonderful fish specialities washed down with a cool glass of ‘Grasavina’, good Croatian white wine. Brac is the longest and most elevated island of central Dalmatia with the highest peak of all the Adriatic islands – the 2,500 ft Vidova Gora. It is also the home of Croatia’s most famously beautiful beach – Zlatni Rat or Golden cape and nearby you will discover the lovely seaside town of Bol, where you can stroll the stone streets and visit the lively market. The island is famous for its creamy white marble that has been used in famous buildings all over the world from the Diocletian’s Palace in Split to the White House in Washington. • Cruise the island’s picturesque and craggy coastline, dotted with historic towns and secluded coves. Not far from the town of Bol, lies the pretty town of Milina, which is typically Mediterranean. You’ll find a number of cultural monuments here. You may also be interested in the 16th century Blaca Monastery. It has an old library, works of art and an observatory. Please note that it is a 45 minute walk up to the Monastery, so best for the more active. 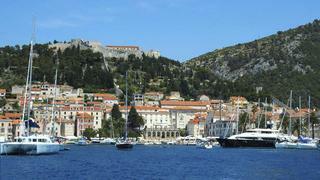 The yacht continues its journey to the next destination – the island of Hvar. This island is definitively one of the most popular Adriatic islands, known also under the name of ‘St Tropez of the Adriatic’; it has a picturesque town with a lively nightlife and many good local restaurants. One which can be recommended is ‘Macondo’ located in the ancient neighbourhood of Groda, it is known for fresh seafood and an old-fashioned atmosphere, try the lobster spaghetti or a platter of Dalmatian-style tapas like anchovies, pâtés, and octopus salad, one of the signature dishes here is the ‘gregada’, a delicious thick fish soup, seasoned with garlic and wine. • Take home some fabulous woven multicoloured scarves, handbags, shells, sarongs, handmade jewellery, or some local designers’ fashions. The island was closed to foreigners until 1989, this isolation has meant that Vis has retained the charm and lifestyle characteristised by the 1950s. 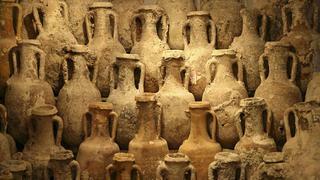 It attracts visitors looking for the ‘Mediterranean as it once was’. Vis is a very picturesque town with attractive stone houses, Renaissance and Baroque palaces and several churches from 16th and 17th century. • Vis town was the most prominent Greek settlement on the eastern Adriatic coast. The Greek town was built on terraces sloping gently to the seafront and fortified by defensive walls, which are partially preserved to the present day. • The Archeological Museum is worth a visit and displays a fine array of Greek and Roman artefacts, especially ceramics and numerous amphorae salvaged from the Greek and Roman vessels shipwrecked off the island. • The Island is also an area of ecological delight, teeming with marine life. It is nice to anchor on the south side of the island, where the sea has sculptured some of the most eye catching coves and beaches. Korcula is quite a large island with an enchanting, typically medieval Dalmatian town, with its defensive towers, walls and red-roofed houses. It is one of the greenest islands in the Adriatic, with dense forest as well as century-old olive groves and vineyards. The ancient towns and villages on the island seem as if they are the land that time forgot. 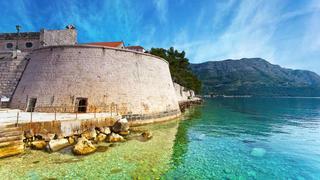 • A Little history – Marco Polo (1254-1324), the famous world traveller and writer, was born in the old part of Korcula. He was captured by the Genoese after his epic journey across Asia to China and taken to Korcula. Here he recounted his tales to a French fellow prisoner during the long period of the negotiations for his release. The house in which he was lodged is now a small museum open to visitors.